This Project is inspired by what we face in daily life. We live with many people around us. One can easily find that in many ways the people surrounding are different from him/her. But sometimes we make the difference a big problem so that we start to hate people, simply because “They are different from me”; a group of children bully another child and say, “You are not in the group!”; some people may go to war just because their “enemies” do not see things the way they do. Hatred, stereotype, and dislike may suddenly come without any reason. Why does it happen? Why we can be friends with some other people but can not be the same with the other people? If we think that “difference” is really a big matter, than actually our friends are also different from us. Then why is that? It is something deep down in your heart. Try to be honest with yourself. 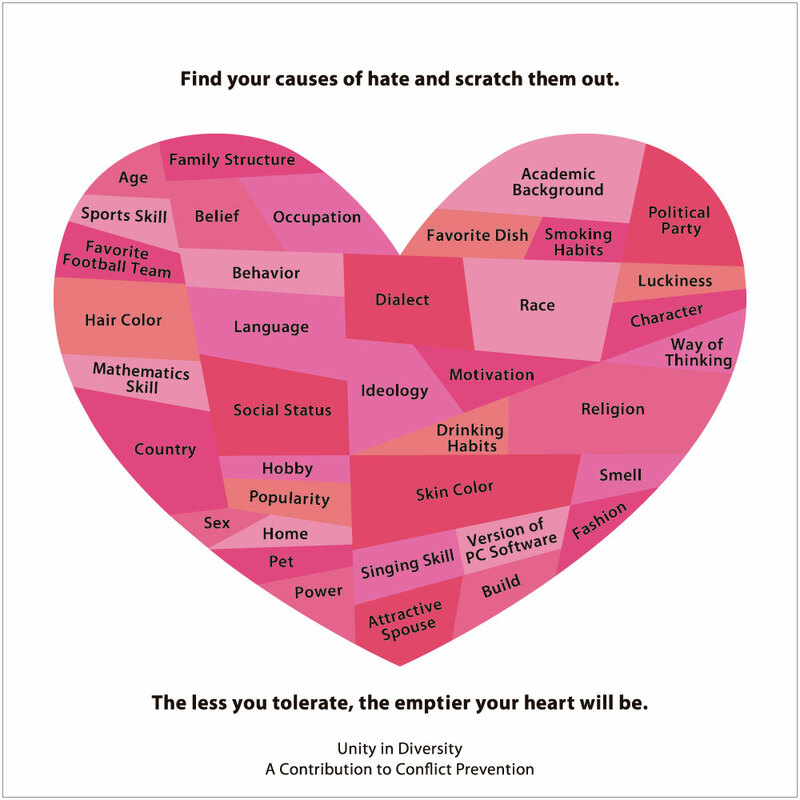 Through this work, please find your causes of hate in the scratch card. Just imagine the heart shape as your own heart. You can see: the more you scratch the items within the heart shape, the worst the shape (and color) of the heart will be. If you find that actually you are not tolerant enough, it is not yet a full stop. It can be changed. Maybe you can not prevent people from telling you bad things about other people (and that what made you have a certain stereotype about some people and then you start hating those people), but you can prevent the hatred from taking control of your life. Try to see the difference as something that colors our daily life. Let`s go hand in hand with other people to make the world a better place to live in. Peace! !